Dance and Organisation is the first comprehensive work to integrate dance theory and methods into the study of management, which have developed an interest in the arts and the humanities. Dance represents dynamics and change and puts the moving body at the centre, which has been ignored and oppressed by traditional management theory. `Being' a leader however also means to `move' like one, and critical lessons can be learned from ballerinas and modern dancers. Leadership is a dialogue, as in the work of musicians, conductors and DJs who manage groups without words. Movement in organisational space, in a museum or a techno club can be understood as a choreography and site-specific performance. Movement also is practically used for leadership and employee development workshops and can be deployed as an organisational research method. 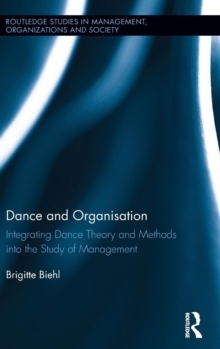 By taking a firm interdisciplinary stance in dance studies and organisational research to explore management topics, reflecting on practitioner accounts and research projects, the book seeks to make an innovative contribution to our understanding of the moving body, generating new insights on teamwork, leadership, gender in management, organisational space, training and research methods. It comprises an important contribution to the organizational behaviour and critical management studies disciplines, and looks to push the boundaries of the academic literature.